Growing environmental problems resulting from farming argue for a shift toward practices that use lower inputs of pesticides and energy and more recycling of energy and materials, according to an article published in the May 2007 issue of BioScience. The author, Craig J. Pearson of the University of Guelph, documents how semiclosed agricultural systems (illustration, click to enlarge) - which he terms "regenerative" - could enhance global sustainability of biological resources, curtail greenhouse gas emissions and groundwater contamination, and reduce farming's reliance on oil imports and water. A switch to regenerative agriculture would involve a variety of changes, including reduced use of inorganic fertilizers and more on-farm energy generation from wind and fermentation of biomass into liquid and gaseous biofuels. It would also reduce overcropping and leakage from manure storage that contaminates groundwater. Yet despite similarities, Pearson's concept of regenerative agriculture is distinct from organic farming; for example, regenerative agriculture does rely on chemically treated fertilizer and would exploit robotic systems. The approach would entail more use of human labor, which is costly, and may reduce output per unit area farmed. But Pearson summarizes studies of organic farming suggesting that price premiums could overcome this disadvantage, and points out that social benefits could be expected. He argues that existing funding programs for farmers could be modified to encourage more regenerative agriculture, and suggests that philanthropists and professional bodies could stimulate its uptake. Obviously, in a first phase such a model should be strictly limited to the affluent world, where consumers are prepared to and are capable of paying premiums for agricultural products. Without these premiums and philantrophic funding, the model is not viable. What is more, extending such a system to the developing world, where achieving the classic goals of agriculture - increased yields and productivity - are the obvious priority, would be a total disaster for millions of people. Moreover, given that many poor countries are dependent on food imports from the North (because of agricultural subsidies there), a generalisation of the system resulting in higher prices, would be a recipee for global hunger - unless subsidy and trade regimes were to be altered drastically, which is highly unlikely. Pearson's exploration of a new form of farming is interesting and some elements of it are not incompatible with conventional agriculture (such as using residues for the production of biofuels), but it should be placed in the broader context of development and the global food system and its injustices. Whereas public health considerations, philosophical reflections, ultra-long term 'sustainability', and consumer perceptions may make the case for organic (or something akin to "regenerative") farming in the affluent West, in the developing world the case for conventional agriculture remains extremely strong. Millions in the South need food first, risky 'green' experiments and ideologies may follow, but later. 2. The problem of greenhouse gas emissions, and the commitment of many governments to addressing rising temperatures and atmospheric concentrations of greenhouse gases, will focus attention on how agronomic practices can be modified to meet targets for greenhouse gas reductions. 3. Rising oil prices (173% from 2002 to early 2006) raise questions about the viability of the trend toward complex, globally distributed agrifood chains, and about the economics of the heavy use of inorganic fertilizers. Rising oil prices also make on-farm generation of energy (from wind, fermentation of biosolids into biofuels, etc.) more attractive, thereby making systems more closed. 4. Large-scale, relatively open, high-input agronomic systems are being criticized for their environmental impacts on landscape aesthetics, biodiversity, soil (e.g., structure, organic matter, biota), groundwater, and—not least—the fabric of rural communities. Agronomic consumption of water is a particularly pressing problem, which will be aggravated by global warming, growing urban populations, and irrigated agriculture. 5. Urbanization has led to awareness of the need to create agronomic–urban juxtapositions or mosaics, which implies reconsideration of less open, and possibly smaller-unit, farming. With these basic (but seriously inconsistent) starting points in mind, Pearson stresses some major differences between his "regenerative" model and that of ordinary "organic" farming. Semiclosed systems, here described as “regenerative,” are those designed to minimize external inputs or external impacts of agronomy outside the farm. For example, the extent to which a system can be called regenerative depends on how much the system minimizes its import of fertilizers and pesticides in excess of what will be removed within the grain or other products (e.g., corn stalks, or stover, to be processed into wallboard or car parts) and eliminates unused by-products. The term “regenerative” is proposed because “semiclosed” is cumbersome and unlikely to attract public support (see point 8, above).By contrast, relatively open systems — which, driven by historical reasons or by comparative comparative prices, constitute mainstream agriculture—have progressively reduced labor and recycling on the farm and increased off-farm inputs (and possibly outputs) such as fertilizers, fuel, and pesticides. Organic systems are those that are certified under a regional or nationally registered scheme. They are examples of semiclosed systems. However, although the concept of a cyclical or regenerative system is the foundation of organic agriculture and is recognized by certification bodies, only the Australian National Standard explicitly mentions closed systems: “A developed organic or biodynamic farm must operate within a closed input system to the maximum extent possible.” Regenerative systems encompass a range of locally adapted “packages” aimed at minimizing inputs, leakiness, and chain distances. They include organically certified agriculture. However, the generic system (regenerative) is not synonymous with the specific example (organic); there are aspects of organic certification that are irrelevant or unhelpful to maintaining a regenerative ystem (e.g., no chemically treated fertilizer is allowed under any of the organic standards). By contrast, regenerative systems with minimized inputs and nonuseful outputs create opportunities for high-technology initiatives such as information technology and robotics. Nonetheless, Pearson's overview often cites studies on organic agriculture, as they provide relatively well-defined and independently researched examples of semiclosed or regenerative systems. All agronomic systems are to some extent open; organic systems, which are a relatively low-technology example of regenerative systems, depend on lower levels of externally sourced inputs, some of which come from nonrenewable sources and all of which incur processing and transport energy and cost. Although not currently required, it would be helpful if all certified variants of regenerative systems (e.g., organic, perhaps some LEAF [Linking Environment and Farming]–certified systems) documented or even set limits to the amount or percentage of inputs that are sourced off the farm; this would proactively address contemporary urban concerns such as energy costs and environmental degradation associated with agriculture. Off-farm inputs are less for regenerative than for open systems, but are seldom zero: Nutrient budget deficits in phosphorus and potassium, and sometimes sulfur, are often identified in organic systems. Soil organic matter routinely increases as systems become more closed. As some recent research indicates, soil quality and health are related to organic matter, with some interesting and perhaps ecologically significant complexities. For example, Popp and colleagues created a soil quality index involving soil water, organic matter, bulk density, and pH; all of these parameters are affected by organic matter. Further, they showed that the relationship between soil quality and crop production varied with the soil system: On poorer-quality soils, inorganic fertilizer and tillage were used to compensate for soil quality, but as the inherent soil quality became more degraded, inorganic inputs became less and less effective. The higher level of soil organic matter in semiclosed systems, compared with open systems, creates greater sinks for both carbon (addressing greenhouse warming) and water (addressing the approaching global water shortage). This also creates a soil microbial flora that is more abundant and more diverse.While this is philosophically attractive, given ecologists’quest to maintain biodiversity, Welbaum and colleagues cautiously conclude that it is not clear whether microbial species diversity is critical to soil health or “merely evidence of built-in redundance.”Higher levels of soil organic matter and water in organic systems also produce more earthworms and microarthropods. With modern molecular biology, it is now opportune to further study soil organisms and their function and management. The energetic efficiency of conventional farming systems compared with more closed systems has been studied through both model farm analyses and modeling. Loake (2001) reviews the energy inputs and outputs, and efficiency, of agronomic systems. Table 1 (Loake 2001, collated from Leach 1976, click to enlarge) illustrates how different the mechanical energetics are for conventional and organic systems. Loake goes on to estimate daily, seasonal, and annual human energy inputs in organic and conventional farming, concluding that although the regenerative (organic) system is more efficient overall, it relies more on human energy and might thereby create stress. Dalgaard and colleagues, Flessa and colleagues, and others have established, at least over short-term studies or audits, that lower energy use and greater energetic efficiency are commonplace in regenerative (e.g., organic) farming systems, at least where there are no anomalies of infrastructure (for example, the need to use more energy to transport organically certified beets to a processing plant, as there was only one available in the country). A recent study based on data collected in Pennsylvania for 21 years showed that organic corn farming, although requiring more human labor than did conventional systems, used 30% less energy because it needed less machinery, fertilizer, seeds, herbicides, and transport to the field, albeit using more human labor (Table 1). Regenerative systems generally require higher on-farm labor than open systems, as evidenced by a survey of 1144 farms in the United Kingdom and Ireland. While this is seen in conventional economics as a disincentive to shift to regenerative systems, the reverse might be argued: Higher labor density (so long as it is economical) maintains or increases social capital and community livelihoods. Furthermore, the higher labor inputs that characterize organically certified production need not be carried into all forms of regenerative agronomy: The application of fertilizers and pesticides through “precision agriculture,” already employed in large-scale leaky systems, could be deployed to minimize or eliminate waste in semiclosed systems, and the economies of scale and substitution of technology for labor evident in industrial agriculture are equally applicable to regenerative systems. In the Pennsylvania comparison, corn and soybean yields after a five-year transition were similar in both the conventional and organic systems, and higher in the organic system in drought years. Elsewhere, crop yields in semiclosed systems are reported to be similar to or lower than those of conventional systems. Where weeds are a problem, lower yields, by as much as 38%, occur in semiclosed systems in Europe, in New Zealand, and elsewhere in North America. In the United Kingdom, Prince Charles’s organically certified farm Highgrove reported wheat yields 50% lower than in neighboring conventional farms. The economic returns for organic systems—a measure of efficiency or productivity that takes account of market worth and not, for example, the costs of externalities — are generally similar to or higher than those for conventional systems. Samples of these are shown in Table 2 (click to enlarge), but the table cannot adequately address the profitability of regenerative systems, for two reasons. First, costs based on organically certified farming are not necessarily applicable to regenerative systems in general. As explained above, to date scientific comparisons of regenerative systems with conventional systems have been limited to organically certified regenerative systems,with their peculiar constraints that create higher labor costs, partly to avoid synthetic chemicals. From a narrow (on-farm) economic perspective, the financial viability of nonorganic regenerative systems is likely to be greater than that of documented organic systems. This is best demonstrated indirectly: The increasing shift to semiclosed (mostly organic) systems, at a rate of perhaps 10% per year, implies profitability, and price premiums (e.g., for organic fruit and vegetables) are maintained despite this expansion. The specific case studies in table 2 generally show lower costs of inputs, except for labor (which could be interpreted as a consequence of organic certification, not of semiclosed systems per se). The lower yields common in regenerative systems are sometimes, but not always, offset by these lower costs; they are more than offset by the price premiums that remain common for the outputs. For example, Pimentel and colleagues found net returns for an organic system (based on lower costs for fertilizer and machinery, zero cost for pesticides, and higher labor) similar to those for a conventional system. Although the returns from the organic farm were lower than those from the conventional farm if the labor costs of the farm family operator were fully priced, the organic farm’s profitability was still greater, assuming a premium of 10% or more on the organic produce. Second, on-farm or whole-farm economic analyses such as those summarized in table 2 do not address the externalities associated with agronomic systems: for example, the costs of manufacturing fertilizer (in money and energy terms) and transporting it to the farm, and the costs of by-products such as excessive fertilizer or pesticides entering the groundwater. Naturally, given that these are difficult to estimate and are subject to many assumptions, to date they have been estimated only at regional or national scales. Thus, although Table 2 may be instructive, it does not obviate the need to assess the profitability of regenerative systems through an approach that considers costs from start to finish— a whole-of-life-cycle analysis—including off-farm societal as well as on-farm individual costs. This will also identify the leaks in current systems that it would be most advantageous to close. Considering national energy use, Dalgaard and colleagues estimated how much energy was used in Denmark for current conventional cropping and how much might be used if the country converted to organic farming. For all crops, despite lower yields, the national energy use per unit of crop production was lower, by between 30% and 60% depending on the crop, in the regenerative system. Furthermore, Pretty and colleagues estimated that, because leakage from farmland would be minimal, the negative external cost of agriculture for the United Kingdom would diminish by £1129.5 million, or 75%, if the nation converted completely to organic systems. There are two approaches to changing agronomic systems: (1) farmer-driven incrementalism and (2) a step change in thinking among farmers, scientists, urban taxpayers and voters, and policymakers. The future design and implementation of agronomic systems does not have to progress linearly from enhancement of conventional technology and thence to open systems with greater use of off-farm inputs. In an approach that counters the trend toward incremental additions of technology to already open systems, mainstream organizations such as the Agricultural Institute of Canada are promoting agronomic best practices that will make systems more closed. These management changes are relatively simple and can be implemented in the short term, although often they will entail some financial cost. In addition, groups of farmers around the world (e.g., in Denmark, Iowa, Australia) have worked together to eliminate or substantially reduce the negative environmental impacts of their farms. Pearson believes that moving to regenerative agronomic systems will be the biggest contribution that can be made to the “greening of agriculture”. By contrast,Trewavas has concluded that “when problems with agriculture emerge they usually hinge around poor management not mode of agriculture.” Pearson's view takes account of the negative externalities associated with conventional agriculture, while Trewavas’s conclusion seems based on maximizing the productivity of the internal agronomic systems. In this context of productivity, advocates of increasingly open systems, and critics of semiclosed systems, suggest dire consequences from reducing production per unit of area. Advocacy of, and research into, regenerative systems will require a shift in mind-set. Urban-based voters in the United States are already accustomed to funding programs for farming and farmers, either through taxation or through environmental cooperatives. The next, essential step is to accept the opportunity to create government programs and private philanthropy that leverage change in agronomic systems. Philanthropy will achieve this directly and through influencing research and government policy. Regenerative agronomy will, of course, require compromises to balance food production and ecosystem services. Economic valuation of ecosystem services may or may not be necessary to obtain the engagement of policymakers.Two aspects of the valuation issue seem relevant here. First, ecosystem services (e.g., provision of, clean water) have two types of value, relating to efficiency (during linear operations) and to safeguarding the system, and its outputs, from catastrophic or nonlinear change. Faber and colleagues describe how trees help avert floods, provide visual appeal, and create preconditions for catastrophic fires to illustrate how they can be valued simultaneously for efficiency and for system maintenance. In the context of this overview, a regenerative agronomic system might be valued for its, say, long-term creation of grain (through normal market economics) and of soil organic matter (measuring efficiency through carbon credit trading). What value for ecosystem services will ensure that an agronomic system is maintained rather than overcropped, which leads to degraded soil structure and desertification or salinization, as millions of hectares of Australian cropland testify? To date, estimates of the value of ecological services such as water have worked within the linear system, not considering valuation against catastrophic change. A second issue regarding valuation is whether it is necessary to create a single value that bundles market economics, ecosystem services, and system maintenance. Creating a single value helps attract the attention of politicians, and economists generally argue that the valuation of ecosystems, and choosing among different options for their management, requires enumeration. By contrast, Gatto and De Leo argue that creating a single monetary pricing approach is dangerous, concealing the complexities of decisionmaking. Nonmarket valuation is a point of conflict “both within and outside the profession [of environmental economics]”. Given the momentum in land-use planning toward participatory decisionmaking, in which trade-offs are achieved mostly through discussion rather than through numerical techniques, it is appropriate to ask whether a thrust in environmental economics toward creating single value systems for market products and environmental services is necessary. Pearson's paper further investigates the need to design agronomic systems for urban–agronomic mosaics, but this aspect is mainly relevant for heavily industrialised and urbanised societies (in North America and Europe). Technical reflections on different strategies to design new agronomic systems are presented as well. Pearson, C. J. "Regenerative, Semiclosed Systems: A Priority for Twenty-First-Century Agriculture", [*.pdf/open access] BioScience, May 2007 / Vol. 57 No. 5, pp. 409-418. Eurekalert: More recycling on the farm could reduce environmental problems - May 1, 2007. Arctic sea ice is melting at a significantly faster rate than projected by even the most advanced computer models, a new study concludes. The research, by scientists at the National Center for Atmospheric Research (NCAR) and the University of Colorado's National Snow and Ice Data Center (NSIDC), shows that the Arctic's ice cover is retreating more rapidly than estimated by any of the 18 computer models used by the Intergovernmental Panel on Climate Change (IPCC) in preparing its 2007 assessments. The study, "Arctic Sea Ice Decline: Faster Than Forecast?" [*abstract] appeared today in the online edition of Geophysical Research Letters. It was led by Julienne Stroeve of the NSIDC and funded by the National Science Foundation, which is NCAR's principal sponsor, and by NASA. "While the ice is disappearing faster than the computer models indicate, both observations and the models point in the same direction: the Arctic is losing ice at an increasingly rapid pace and the impact of greenhouse gases is growing." - Marika Holland, NCAR scientist. "This suggests that current model projections may in fact provide a conservative estimate of future Arctic change, and that the summer Arctic sea ice may disappear considerably earlier than IPCC projections," says Stroeve. Image: the graph illustrates the extent to which Arctic sea ice is melting faster than projected by computer models. The dotted line represents the average rate of melting indicated by computer models, with the blue area indicating the spread among the different models (shown as plus/minus one standard deviation). The red line shows the actual rate of Arctic ice loss based on observations. The observations have been particularly accurate since 1979 because of new satellite technology. (Illustration by Steve Deyo, ©UCAR, based on research by NSIDC and NCAR. National Center for Atmospheric Research: Arctic Ice Retreating More Quickly Than Computer Models Project - April 30, 2007. 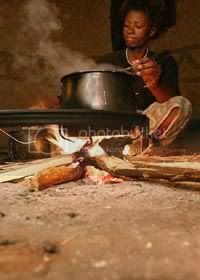 New estimates by the World Health Organisation (WHO) provide a grim overview of the disastrous health effects of fuel wood and coal used for cooking and heating in the developing world. In the 21 worst-affected countries, close to 5% of death and disease is caused by indoor air pollution, according to new research published by the WHO. In 11 countries - Afghanistan, Angola, Bangladesh, Burkina Faso, China, the Democratic Republic of the Congo, Ethiopia, India, Nigeria, Pakistan and the United Republic of Tanzania - indoor air pollution is to blame for a total of 1.2 million deaths a year. Globally, reliance on solid fuels is one of the 10 most important threats to public health. "The prevention potential is enormous. Solutions are available, and it is our international responsibility to promote the health and well-being of those affected, who are mostly women and children." - Susanne Weber-Mosdorf, WHO Assistant Director-General for Sustainable Development and Healthy Environments. WHO: Indoor air pollution takes heavy toll on health - April 30, 2007. Two bits of news from Gambia and Kenya indicate that biogas is receiving increasing interest on the continent. The fuel has the advantage that it requires relatively simple and affordable technologies (anaerobic digesters) and that it can be made from a wide variety of biomass feedstocks. At the household level, this form of bioenergy can replace air polluting fuel wood, which is a real killer in the kitchen (earlier post). Moreover, the biofuel can reduce deforestation and help mitigate climate change, since a growing body of evidence shows fuel wood cooking stoves are big culprits in global warming (earlier post). In Kenya, experts from around the world are invited to brainstorm at a conference on biofuels to be held in Nairobi from May 20 to May 23. Anthony Okwura, a Nigerian biofuels expert and member of the Manufacturing Association of Nigeria (MAN) is one of the invitees. Het told the News Agency of Nigeria (NAN) in Lagos yesterday that the conference would also deliberate on energy and rural development, livestock, healthcare delivery and employment generation. He said the experts are expected to use the wealth of their experience to design a biogas training programme for African countries. According to Okwura, who is the Chief Executive Officer of Car Component Industry Limited, based in Lagos, the conference will also carry out a feasibility report on biogas promotion programme in the continent. He explained that the conference, whose theme is: “Biogas for a Better Life—an African Initiative” [*Dutch], was a follow-up to a similar initiative launched in Amsterdam, the Netherlands last year. Okwura, who was a former director in the Federal Ministry of Industry said the conference would also look at how companies could produce biogas and sell to households in various African countries. He said the four-day conference would deliberate on how to improve the human condition of women and children in Africa and how to reduce the use of firewood in the continent. “The experts will also find ways to enhance agricultural production and soil fertility in African countries as well as reduce the emission of green house gases," the industrialist said. After having drawn an alarming picture of the consequences of human activities on the environment, Kanja Sanneh, Secretary of State for Agriculture, called climate change an "outcome of our actions." "I am sure you all will agree with me that we are facing crisis right in our kitchens! More than 80 per cent of Gambians depend on fuelwood for our cooking. On average, a Gambian uses half a kilo of fuelwood to cook a meal in a day. Consequently, we are either spending 100 per cent more money on a bundle of fuelwood or spending double the time to collect them than what we did 10 years ago," he added. Besides these significant statistics, the sectretary said the national workshop will demonstrate that there are solutions that can help to meet some of the cooking energy demands through the use of biogas renewable energy. He then reiterated that the government will give full support to such a project. Haddy Jatou Sey, Social Development Specialist at the World Bank, told the press that the development of biogas projects will help to reduce deforestation. She confirmed that the women using biogas plants in their households have witnessed tremendous changes that the technology brought to their life. At the workshop, participants seized the opportunity to gear up towards the use of biogas technology as an alternative energy source. They also expressed concerns about the affordability of a biogas plant, suggesting it should be within reach of Gambians households. On the eve of this May Day, Fidel Castro published some further reflections on energy, biofuels and sugar cane. In the text the dictator refers to his historic plan to produce "Ten Million Tons of Sugar" [*original speech, translated in English] by 1970, to sell it to the USSR in exchange for... oil. Fidel Castro's first deal with the Soviets was a sugar-for-fuel agreement, implemented immediately after the economic embargo was launched by the US in 1960. The embargo cut off Cuba's access to energy, so the revolutionary island state became entirely dependent on the Soviet Union which had to supply all of its fuels. In 1968, reminiscent of Mao's "Great Leap Forward" steel-making fantasy, Castro launched the "Ten by Seventy" program and gave each Cuban a machete to cut sugar cane. The collective effort achieved a production of 8 million tons. Below target, for sure, but a huge increase in output compared to previous years. The project showed that tropical communists will not hesitate to bet on sugar to lift their economy out of misery. The question is: if, back then, it was a good plan to barter Socialist sugar for Soviet fuel [*.pdf], then why it is a bad idea to make ideology-neutral biofuels out of sugar cane today, in this era of Peak Oil? I hold nothing against Brazil, even though to more than a few Brazilians continuously bombarded with the most diverse arguments, which can be confusing even for people who have traditionally been friendly to Cuba, we might sound callous and careless about hurting that country’s net income of hard currency. However, for me to keep silent would be to opt between the idea of a world tragedy and a presumed benefit for the people of that great nation. Before Bush’s trip to Brazil, the leader of the empire decided that corn and other foodstuffs would be suitable raw material for the production of biofuels. For his part, Lula stated that Brazil could supply as much biofuel as necessary from sugar cane; he saw in this formula a possibility for the future of the Third World, and the only problem left to solve would be to improve the living conditions of the sugarcane workers. He was well aware –and he said it-- that the United States should in turn lift the custom tariffs and the subsidies affecting ethanol exports to that country. Insatiable in its demand, the empire had flung into the world the slogan of producing biofuels in order to liberate the United States, the world’s supreme energy consumer, from all external dependency on hydrocarbons. Today, in that country, almost 80% of sugar cane is cut by hand. Sources and studies made by Brazilian researchers affirm that a sugarcane cutter, a piece-work laborer, must produce no less than twelve tons in order to meet basic needs. This worker needs to perform 36,630 flexing movements with his legs, make small trips 800 times carrying 15 kilos of cane in his arms and walk 8,800 meters in his chores. He loses an average of 8 liters of water every day. Only by burning cane can this productivity per man be achieved. Cane cut by hand or by machines is usually burned to protect people from nasty bites and especially to increase productivity. Even though the established norm for a working day is from 8 in the morning until 5 in the afternoon, this type of piece-work cane cutting tends to go on for a 12 hour working day. The temperature will at times rise to 45 degrees centigrade by noon. Add to this that it is very difficult for Brazil to rotate corn and legumes. Of the Brazilian states traditionally producing corn, eight are responsible for ninety percent of production: Paraná, Minas Gerais, Sao Paulo, Goiás, Mato Grosso, Rio Grande do Sul, Santa Catarina y Mato Grosso do Sul. On the other hand, 60% of sugar cane production, a grain that cannot be rotated with other crops, takes place in four states: Sao Paulo, Paraná, Pernambuco and Alagoas. Brazil does produce an excellent food that is especially rich in protein: soy, fifty million one hundred and fifteen thousand (50,115,000) tons. It consumes almost 23 million tons and exports twenty-seven million three hundred thousand (27,300,000). Is it perhaps that a large part of this soy will be converted to biofuel? Image: Revolutionary Cuba's first formal deal with the USSR was a sugar for fuel scheme, agreed between Chairman Khrushchev and Fidel Castro. The Renewable Energy and Energy Efficiency Partnership (REEEP), one of the leading non-profits promoting clean energy in the developing world, is studying the potential and problems associated with biofuels in South Africa. Simon Wilson of the African Sustainable Fuels Centre leads the effort for REEEP and helped produce a study assessing the biofuel potential of the country. In this exclusive article, he sketches the complexities of the situation and concludes that a strong land use policy is key to developing biofuels in a country with limited resources. Biogas for local use may be more feasible than the production of liquid biofuels, Wilson argues. Compared to other countries on the continent, South Africa has a low technical biofuel potential (earlier post), but major sugar cane growers there are prospering. Tongaat-Hulett, an important local sugar producer, reported a 47% increase in operating profit to ZAR 470m (US$67m) in 2006. Like other sugar cane producers, the company operates in the Eastern part of South Africa radiating from the province of Kwazulu Natal. It is one of the few that has decided to invest in the ethanol business by building an ethanol plant, though this will be located in Mozambique. Other more local plants could eventually follow (earlier post). “South Africa is exporting sugar on a regular basis, and this should be our initial choice for ethanol feedstock,” comments Remi Burdairon, manager of commodity trader Louis Dreyfus, which may also take a stake in local biofuels production. Ethanol could be a major earner for South Africa’s sugar industry, which is 13th largest in the world. All roads are open to biofuels producers. Maize, sugar cane, soya and lesser known crops are all possibilities. Agricultural companies are poised to act on a big opportunity, as the South African government says it wants biofuels to make up 4.5% of the nation’s fuel (75% of its renewable energy target). It wants an 8% and a 2% blend for bioethanol and biodiesel respectively and is open to different types of crop (earlier post). But as industrialists, politicians and farmers consider the future, a delicate question needs to be addressed. Which land is most suitable, and how should it be used? Could the cultivation of land for biofuels encroach upon food production or create pressure on arable land, thus perhaps jeopardising the livelihood of small-scale and subsistence farmers? Joe Kruger, Managing Director of Ethanol Africa, argues that maize is the way forward. There are around 9,000 commercial maize producers as well as thousands of small-scale farmers in South Africa, which produces 8.8 million tonnes on average per year. The company plans to open eight ethanol plants primarily using maize feedstock. The first will open in Bothaville and the last is due to be commissioned in 2012. All will be located inland in the central and Eastern part of the country (earlier post). “South Africa is a major consumer of maize; it’s a large industry but it’s shrunk locally in the last few years as consumer patterns have changed and people eat different types of food,” argues Kruger. This, he suggests, is creating more maize availability, which can be diverted for fuel production. At the moment, there is a three million tonne surplus of white maize that he says could be switched to the yellow maize suitable for ethanol feedstock. Hence, he believes that land use at the moment does not need to be increased to accommodate maize production for ethanol. Maize grown for ethanol would be on dedicated land. It could be an attractive proposition. Many European countries are mandating biofuels content, but there is not enough local production. Hence, substantial imports are likely. Japan and South Korea, too, could be important export markets for Southern Africa. Japan alone might be importing around 75% of the world’s fuel ethanol in 2012, according to statistics provided by Ethanol Africa. At the same time, North American demand for maize for ethanol production, combined with a distorted market and questionable trade regimes, has been creating a tight maize market (earlier post). Under these conditions, South African companies could be in a good position, as they can supply the global market but benefit from lower production costs and, in some respects, better economics, than some of their international competitors. But Remi Burdairon, whose company trades in a range of different commodities including maize and soyabean, counsels against counting on maize. “Even until two months ago, the possibility of maize industrial production for ethanol was highly questionable. Up until now, the market has been very much in balance. Yes, it is becoming more viable, but it has been dangerous as a prime feedstock up until now,” he comments. His argument is based on the fact that the industry’s track record does not provide a sure enough footing to plan ahead. That is why he points to the sugar industry. Whereas the maize track record is variable, sugar production in South Africa has consistently produced a surplus that has in turn been sold overseas or in neighbouring African countries. Hence, there is less risk of the emergence of food/fuel competition. There is further potential for sugar production but this could create its own problems relating to land and also water use, as sugar plantations often absorb heavy amounts of water. However, a UK-Brazil-South Africa partnership study published in July 2006 on behalf of the UK Office of Science and Innovation found clear possibilities emerging for the Southern African Development Community (SADC). An increase in bioethanol production, it said, could come about by improving yields in current sugar cane crops, diverting some production from food to fuel and also increasing sugar cane cultivation. Sugar cultivation, it said, could be more than doubled to 1.5 million hectares in the region over the next 10-15 years. Although some of this could be in South Africa, the possibilities for expansion are limited there, while other countries show more promise. However, South African gasoline consumption makes up 80% of the whole region and the development would therefore act as a major response to new South African ethanol demand. If this land usage were doubled, sugar cane production would meet more than twice the current regional sugar consumption while also creating 7.3 billion litres of bioethanol each year. It is an attractive option, because the sugar cane-bioethanol fuel chain “has the potential to be among the lowest cost and lowest CO2 fuel chains,” according to the report’s authors. There are around 47 000 registered sugarcane growers producing an average 22 million tonnes of sugarcane, and more than 45 500 of these are small-scale growers, according to the South Africa Sugar Association. About 80% of production comes from larger commercial players. Since land extension possibilities are limited, however, most supply increases for ethanol would need to be found from yield improvements or from the annual surplus, or from land consolidation, whereby individual plots too small to produce sugar cane commercially would be aggregated and the biofuels company would lease it. Some of these plots are on land that is currently degraded, and pilot projects have shown that this system has worked to a limited extent: “Production has risen to 70t/hectare, far higher than non organised small scale farming where 30t/hectare is the average, but not as high as commercial farmers who average 120t/hectare,” state Annie Sugrue and Richard Douthwaite in a 2006 report on land use. Annie Sugrue, the South African co-ordinator for the international NGO Citizens United for Renewable Energy and Sustainability (CURES), warns against “huge mono-cropping”, especially of maize: “we don’t believe it shows a good energy balance – we’re completely against it and any possible competition with food. The maize production is up and down, and a surplus is not guaranteed,” she asserts. Instead, she promotes the use of perennial crops, including jatropha, moringa (a tree which produces no waste as all its parts can be used) and two local plums. Under optimal conditions jatropha can generate 2.5 tonnes of biofuel/hectare out of jatropha in comparison to, for instance, soya, which averages at 0.8 tonnes/hectare. Sustainability campaigners favour the use of intercropping which enhances productivity, and they propose the development of food forests that include different types of plants (trees and bushes) as well as species. These plantations also offer advantages to local communities. ”We have lots of arable land but it’s degraded, and long-term crops such as these help to stabilise and improve it over time. A lot of the degraded arable land is owned by small-scale farmers,” says Sugrue, pointing out the benefit to this group. Simon Wilson is working on a biofuel project in South Africa for REEEP, the highly recognised global organisation promoting the development of clean and sustainable energy. He says that “agricultural energy production has the potential to conflict with a large number of other natural resources, not just land area. Increased agricultural production of food and energy crops together will undoubtedly increase the use of many agricultural inputs including water, fertilizers, agricultural chemicals, and these increases may result in impacts to the production system itself through loss of fertility, soil biodiversity and availability and quality of water. Local issues are on the agenda. The government has opted for a policy which considers small-scale farming needs, and forthcoming land reforms will also help. But perhaps there is no need for biofuels at all: “Europe will import, but 30% of our people don’t have energy,” points out Annie Sugrue. Instead she suggests that biogas, which would be used locally, might be a more suitable option. Besides funding and creating public-private partnerships for concrete biofuel projects in Africa, REEEP works towards developing innovative financing mechanisms, political capacity-building and disseminating important information on case-studies and broader analyses of the sector. REEEP's acitivities in Southern Africa. British Government, Dept. of Trade and Industry: Brazil - UK - Africa: Partnership on Bioethanol Scoping Study, s.d. [July], 2006. African Sustainable Fuels Centre: National Biofuels Study [*.pdf], March 20, 2007, an investigation into the feasibility of establishing a biofuels industry in the Republic of South Africa which was prepared to assist in the development of a national strategy.